A lot can be said by the type of watch a person wears. You want your watch to make a good impression for you. TAG Heuer prides itself in creating exceptional timepieces. One such piece of art is the Carrera Calibre 1887 Automatic Chronograph 43mm CAR2012.FC6235. Crafted to perfection, this is the one watch you can’t live without. This Carrera provides you with extra durability given that only a diamond is able to scratch its sapphire crystal. So you won’t have to constantly worry about ruining your watch. It features a date window at the 6 and a running second at the 9. In addition, it has a chronograph minute at the 12 and a chronograph hour at the 6 to cover all your timing needs. The contrast of the silver dial against the black strap really helps the rose-gold numbers pop out. The use of polished steel material as well as luminescent markers makes this watch shine. Having an alligator strap as opposed to a steel band, this watch provides comfort as well as style. And this Carrera isn’t all about the looks either. 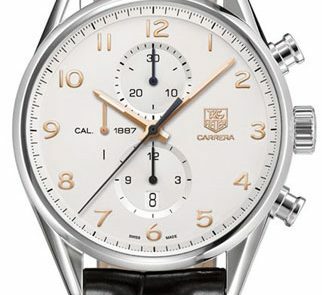 This watch is from the Carrera Calibre 1887 Chronograph collection, which is part of the 1877 movement. 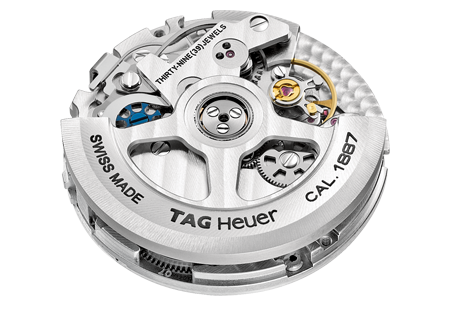 This movement is marked by 320 parts creating an automatic 29.3mm calibre, swift date correction, 28,800 vibrations per hour (4Hz), and a 50-hour power reserve. What doesn’t this watch have? This is what makes a TAG Heuer tick. Some qualities of this TAG Heuer model may seem less appealing to certain people. Though the watch itself is water resistant up to 660ft, any water will damage the alligator strap, which seems contradictory. And despite any precautions or care you take for the strap, the material will still fade over time. Condensation also appears under the crystal during a sudden temperature change. This, however, goes away by itself without any damage to the watch. 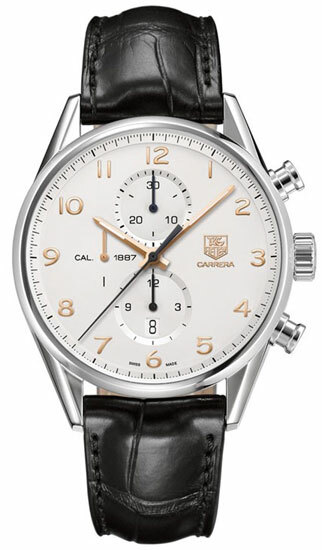 The Carrera Calibre 1887 Automatic Chronograph 43mm CAR2012.FC6235 retails at about $5,500. It may be a little more than what you would normally spend on a watch; however, you must take its state of the art quality into consideration. With this smart purchase you’d be getting accuracy as well as durability. Be proud of what you wear.